A young cross country runner in California is tearing up courses at a pace never seen before, leading some experts to already proclaim that she may soon be considered one of the great prep runners of all time. 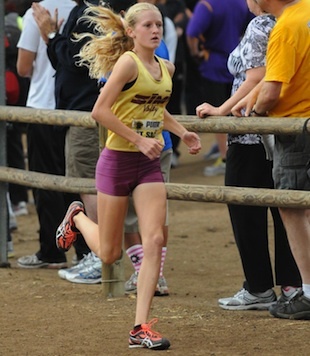 As reported by the Riverside Press-Enterprise, Simi Valley (Calif.) High junior Sarah Baxter won the Mt. SAC Invitational with a blistering time of 16:00. That time obliterated a previous 11-year-old record on the three-mile course -- widely considered one of the toughest in the state and possibly the nation -- by some 16 seconds, leaving area writers and prep track analysts completely agape at the time she turned in. "[Baxter's 16-minute run is] the most amazing female individual performance in U.S. prep annals," PrepCalTrack.com editor Rich Gonzalez, one of the most respected track analysts on the West Coast, wrote on his website. "'Greatest High School Performance Ever.'" For some sense of just how dominant Baxter's performance was, all one need do is take a glance at her closest competitor. The second-place finisher at the Mt. SAC Invitational was Santa Clarita (Calif.) Golden Valley High star Chelsey Totten, who crossed the finish line at 17:08. That's more than a minute after Baxter finished, across a span of just three miles! You can see just how long that was in real time in the video of the Mt. SAC finish line directly below, as filmed by Christina Truong. Baxter has been turning in blazing times in cross country and on the track, but her performance at Mt. SAC was stunning even for her past success. Her prior personal best was a time of 16:41, and she entered the invitational with a goal of topping that time. According to the Ventura County Star, her coach, Roger Evans, told her to try and run a 16:35. She bettered that by 35 seconds. "Afterward there were people who said that that was the most remarkable race, not only in high school cross country history, but that maybe it'll go down in the annals [of all time], maybe like Billy Mills in the [Olympic] 10,000 meters in Tokyo," Evans told the Star. "It was something they thought insurmountable, that a girl could run that fast."